Tom Hiddleston auditioning for the role of Thor makes me laugh every time I see it. It's like if Martin Freeman played Sherlock and Benedict Cumberbatch played John. It's just... wrong. Lol. What if in an alternate universe Tom was Thor?" "Tom: [stands on an Apple box to look taller] Come home, Brother! Dave: He’s not a dude, you’re a dude. This, this is a man! [points to Tom, who is significantly slimmer] A handsome... muscular man! Zoe: It’s like his muscles are made of cotati metal fibers! Chris P: Stop massaging his muscles! Producers reviewing the old footage: You know, I feel like we made a bad call on this casting. Marvel Execs: It’s too late. We’re already in Phase 3!" Interviewer: "Who is the better villain to grace the MCU stage: Loki or Thanos?" Tom Hiddleston: "I mean... *laughs* Well, I’ve had a little more time to build my case, I think. It depends on what you class as 'better', I suppose. Loki, I think, is accessible, relatable, vulnerable, charming, better dressed, generally more stylish, witty, charismatic. And Thanos... is more purple." Closer! Maybe it's the way Tom plays him, but he just doesn't seem all that evil to me … more, as the man says, heartbroken. 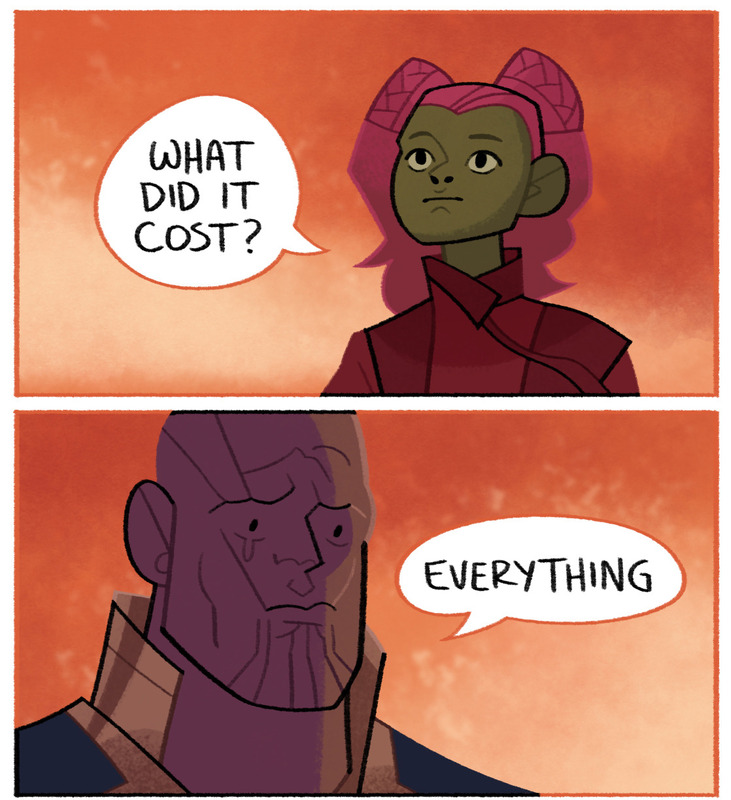 But then Thanos doesn't really seem all that evil either, does he? He's just … narrow-minded? Mmmmm no Thanos seems pretty evil to me, lol. He tortures people, including his own "daughters". He forced Gamora and Nebula to fight each other when they were children, and every time Nebula lost, he replaced one of her body parts with machinery to make her Gamora's "equal". That alone is pretty evil, lol. I would place Loki in the 'villain' category for the first 'Avengers' film at least. He did some pretty villainous stuff there though his motives were complex. Loosely speaking I would consider him the villain of the first 'Thor' film too, though a sympathetic one. Do I remember correctly that you haven’t seen either of the ‘Guardians’ movies? You learn a little more about Thanos from the perspective of Gamora and Nebula in those films. Regardless of his motives and actions concerning the Infinity Stones, I’d consider him evil just based on the other horrible things he’s done. But even in ‘Infinity War’, there were other things besides The Snap. When Nebula said, “You should have killed me,” he responded with, “It would have been a waste of parts!” He forced Eitri the dwarf into making the Infinity Gauntlet by threatening to slaughter all of his people, and then he killed them anyway and cut off Eitri’s hands. He played twisted psychological games by pushing Quill to make good on his promise to kill Gamora if she fell into Thanos’ hands, when he knew all along he’d just “change reality” to whatever he wanted. None of that was necessary to further his “cause”. My point being that genocidal mania is only one of his problems. He’s just a cruel person. Cruel for cruelty's sake, do you think? Or is he just … well, a psychopath? Unable to empathize or feel remorse. Wonder if his whole race was like that or if he's just a very twisted specimen. 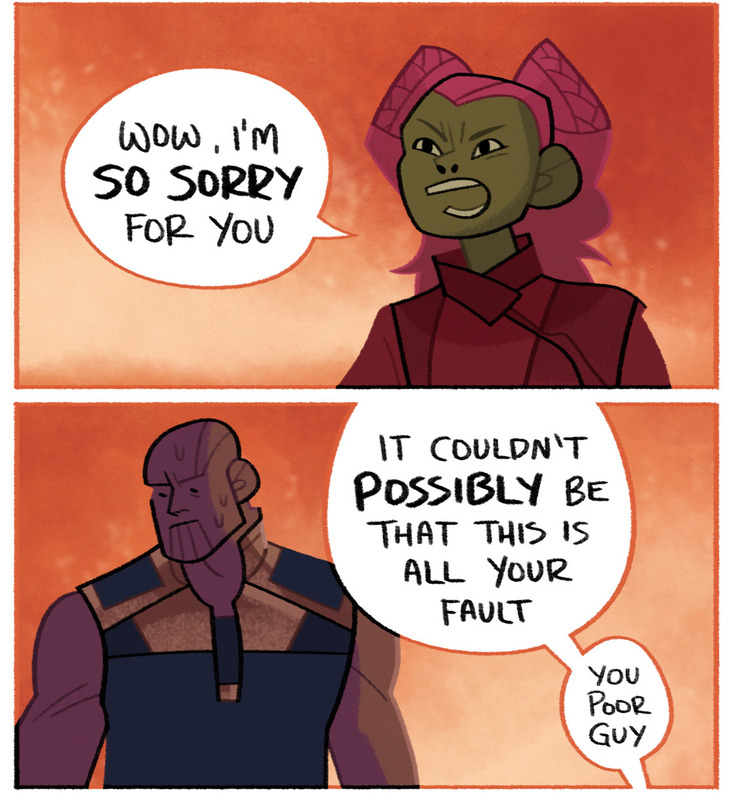 And yet he seems to regret "having" to kill Gamora. Which makes him even creepier, somehow. I'm trying not to get too excited about Endgame, avoiding most of the speculation, etc. … I always regret it when I let the anticipation build up too much. At the same time, I can't remember the last time I looked forward to seeing a movie this much. I’m not sure, but I don’t think it really matters. He’s just as bad either way. Wonder﻿ if his whole race was﻿ like that or ﻿if he's just ﻿a ve﻿ry﻿ ﻿twisted speci﻿me﻿n﻿﻿﻿. I wondered that too. When he was talking about life on Titan, he did say that when he proposed randomized genocide to keep the population down, they called him a madman. (He’s also referred to as ‘The Mad Titan’.) So that might suggest his sensibilities were not typical. It’d be interesting to see a little flashback to Titan culture. I'm﻿ trying not to get too excited about Endgame, avoiding most of the speculation, etc. … I always regret it when I let the﻿ anticipation build up too﻿ muc﻿h﻿. ^ Same. I like artwork, but for the most part I stay away from fan theories and such. I’ll just wait and see what happens. I’m excited, but also a little anxious because I’m worried about character deaths. I really hope there are none and they find more creative ways to end character arcs, but that might be too much to hope for. I’m preparing myself to be sad, lol. That scene gets my goat a bit. ‘Cause I agree with Gamora, “This isn’t love.” Yet he was still ‘rewarded’ for his ‘sacrifice’ with the Soul Stone. I think that’s kind of a bad message, lol. I’m excited, but also a little anxious because I’m worried about character deaths. Yeah, I'm expecting to do a little mourning myself. I just hope it's not Tony. But that would be the death that would gut everyone the most, I bet. Maybe Cap. Urgh. ‘Cause I agree with Gamora, “This isn’t love.” Yet he was still ‘rewarded’ for his ‘sacrifice’ with the Soul Stone. I think that’s kind of a bad message, lol. I'm wondering if that might come back to bite him, somehow. I'm hoping so; it would be fitting. I like it when karma comes around. Oh, right, I remember that. Why, I'm not sure … I can't remember if he ever appeared in any of the comics I read. He looked familiar when I first saw him, but nothing about the story line rings a bell. I think I may have him confused with Galactus. Tony would be the absolute worst. I'd be really sad about Cap too, but I could live with it because he's always been a "man out of time", and he doesn't have many current attachments. Tony has Pepper, and possibly a child on the way. I read a theory that with the time travel stuff, Cap could end up back in his original time, and live out a normal life with Peggy. That would be nice. I think either way Cap will be out of the picture, because there's a new "Captain" in town. So I'll either be mourning some deaths or mourning the end of an era. Or both. I sure hope so! After the way he treated her, I think Nebula deserves to be the one to kill him. I sorta doubt they'll go that route though. He looked familiar when I first saw him, but nothing about the story line rings a bell. His storyline in the 'Infinity War' movie is different from his storyline in the comics (which I never read myself). In the comics he's trying to court Mistress Death, so he kills half the universe in an attempt to win her affection. I posted this comic in the other thread too, but considering the topic at hand I thought it was fitting. I don't feel sorry for you, Thanos.